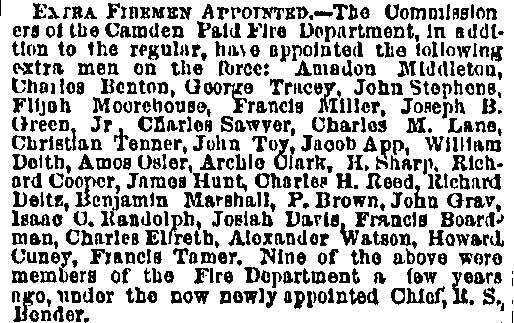 BENJAMIN MARSHALL was appointed to the Camden Fire Department as an extra man with the Hook & Ladder Company in the spring of 1877. He replace John Vanstavern, and after one year was himself replaced by William H. Doughten. According to Fire Department records, Benjamin Marshall lived at 939 Newton Avenue and was working as a barber when appointed to the Fire Department. As to who Benjamin Marshall was before coming to the Fire Department and after leaving, the record is not clear. A Benjamin Marshall, who was a grocer, with ties to Cape May County, was living in Camden when the Census was taken in 1870. He was back in Cape May at the time of the 1880 Census. No one named Benjamin Marshall appeared in any Camden City Directories in the years between 1878 and 1899, nor were any of the other men named Marshall working as barbers in the 1878-1879 or 1881-1882 Directories.